It's Friday! Where did the week go? Pray you've had a good week filled with lots of fun and love! Today I'm co-hosting (First time to co-host with someone! So exciting!) Finding Beauty Friday with the incredibly talented Aimee who is over at This Darling Day. 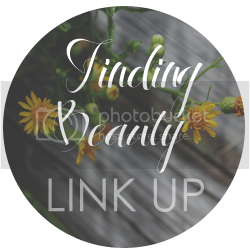 If you have any beauty finds from this week or a beautiful photo stowed away in a file on your computer somewhere, join in on this fun and inspiring link-up! Bedtime routines have been the same since Linus (our youngest) was born. We all gather in the boys' bedrooms, have family prayer time, then give hugs, kisses, and ugga-muggas. It's one of my most favorite things! Ever since Linus was itty-bitty, Bigfoot has been smothering him with hugs and kisses. And now, they just go to each other, instinctively, after prayer is done. 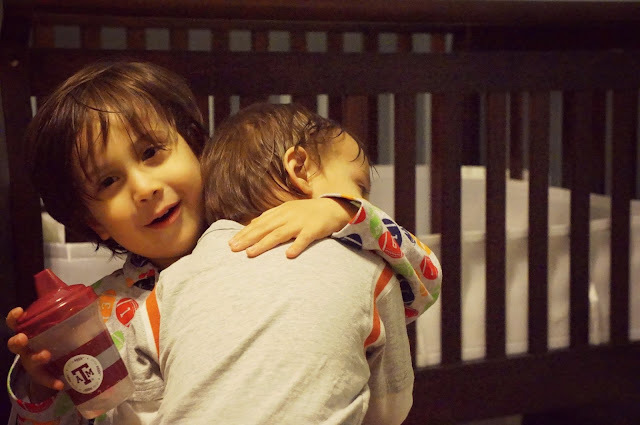 Every night they share hugs and kisses no matter what spat they just had or if they were on cloud nine, they just go and love on each other. It's the sweetest! These brothers. Gosh, I love them and their beautiful brotherhood. So excited to see y'alls Beauty Finds! And if this is new to you, like I mentioned earlier, join in on the fun! My daughter is 8 now and our bedtime routine is still as important. I love seeing parents take on their parenting role in a serious and loving way. Your boys are dear. Thank you so much, Sarah! I never expected the sweetness these two would add to some of the simpler things in life, such as bedtime. Oh my gosh - that photo is just adorable! Stephy, Thank you! I'm so glad I took the time to take it. I really do want to remember this sweetness. PS I love that you go by Stephy. I have a cousin who does also and just love her! Thanks for coming by! I remember once hearing a man say, "The greatest we can give our children is siblings." I did not get that until I started having children. Sweet picture. I love that photo. I'm getting antsy for children even though I won't be married until May. We'll likely adopt but I can't wait for my chldren to be part of my life!